Don’t leave cutters loose in a drawer or tool bag, as they are likely to get chipped and blunted. 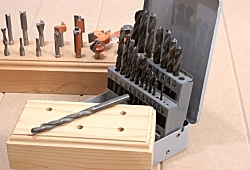 If you drill a block of wood to stand them in, drill the holes to give clearance for the shank. The twist drills in my Imperial boxed set increase in increments of 1/64in, so I use a 17/64in drill for 1/4in shanks and 21/64in for 8mm shanks. For 1/2in shank cutters I use a 13mm auger drill.